GandhiServe Foundation created this Ning Network. View the calendar on its web site! Insert the calendar on YOUR web site! 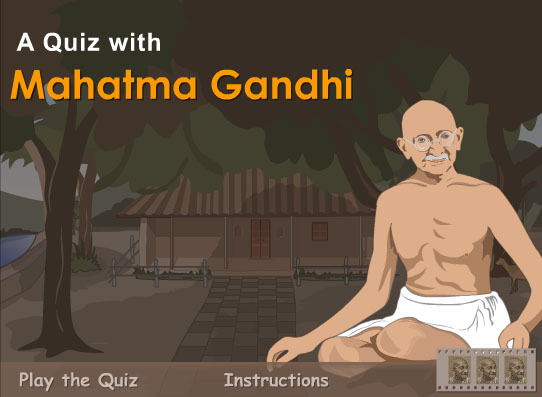 Let your visitors always be up-to-date what's going on in the Gandhian world. Download the teamup calendar app on your mobile phone! Have the Gandhi Event Calendar always at your fingertips! Welcome to GandhiTopia - the meeting point for Gandhian students, scholars, activists and institutions on the web! Together we can create a unique information pool to benefit the global Gandhian and peace-loving community. Let's join hands to bring Mahatma Gandhi to life and work for a Gandhian utopia: a world of Peace and Nonviolence! Skype: GandhiServe - Get Skype and call me for free. Read more (pdf) - Our first newspaper article! 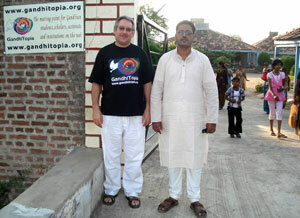 Peter Rühe and Balamurali Balaji at the entrance of Sevagram Ashram guest house. "Perhaps never before has there been so much speculation about the future as there is today. Will our world always be one of violence? Will there always be poverty, starvation, misery? Will we have a firmer and wide belief in religion, or will the world be godless? If there is to be a great change in society, how will that change be wrought? By war, or revolution? Or will it come peacefully? Different men give different answers to these questions, each man drawing the plan of tomorrow's world as he hopes and wishes it to be. I answer not only out of belief but out of conviction. The world of tomorrow will be, must be, a society based on non-violence. That is the first law; out of it all other blessings will flow. It may seem a distant goal, an impractical Utopia. But it is not in the least unobtainable, since it can be worked for here and now. An individual can adopt the way of life of the future - the non-violent way - without having to wait for others to do so. And if an individual can do it, cannot whole groups of individuals? Whole nations? Men often hesitate to make a beginning because they feel that the objective cannot be achieved in its entirety. This attitude of mind is precisely our greatest obstacle to progress - an obstacle that each man, if he only will it, can clear away."